A Texas transplant who landed in Southern California, bassoonist and contrabassoonist Dan Weiss has traveled the country performing, collaborating, and teaching bassoon to a wide variety of audiences. He has been both soloist and section member of symphony orchestras, wind ensembles, and stage productions, and has worked to spread the love and appreciation of classical music to new groups of people through exciting performances and demonstrations. At a young age, Dan began experimenting with bassoon, later picking up sax and guitar. 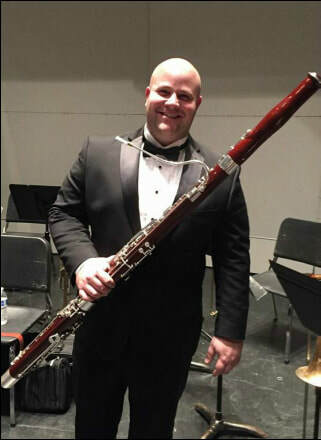 In high school, along with preparing for state-level competitions, Dan sat principal bassoon of the Gilbert and Sullivan Production Orchestra, and attended the summer band and orchestra camps held at Texas Tech University. He attended the summer Interlochen Arts Academy advanced bassoon institute and summer orchestra for two years. In 2001, Dan moved to the Central Coast of California, which provided many advantages for music making, including the opportunity to play with the San Luis Obispo Symphony, the Music Academy of the West Festival Chamber Ensemble, and the Carmel Bach Festival. He regularly performed with the San Luis Obispo Wind Quintet, including exhibition performances at Festival Mozaic, the annual world renowned Mozart Festival of San Luis Obispo. Since moving to San Diego in 2006, Dan has performed with a number of groups, including the San Diego Festival Chorus and Orchestra, Mainly Mozart Festival, San Diego City Ballet, Opera NEO, the Villa Musica Symphony Orchestra, New City Sinfonia, San Diego Junior Theatre, and the Imperial Valley Symphony. Dan has performed in concert with Evanescense and Lindsey Stirling. He co-founded and is the Artistic Director of the Left Coast Quintet, an ensemble that seeks out innovative jazz and pops arrangements for small wind ensemble. Dan is the manager for the Villa Musica Symphony, and contracts musicians for a variety of performances around the city, including corporate events, weddings, and fundraisers.